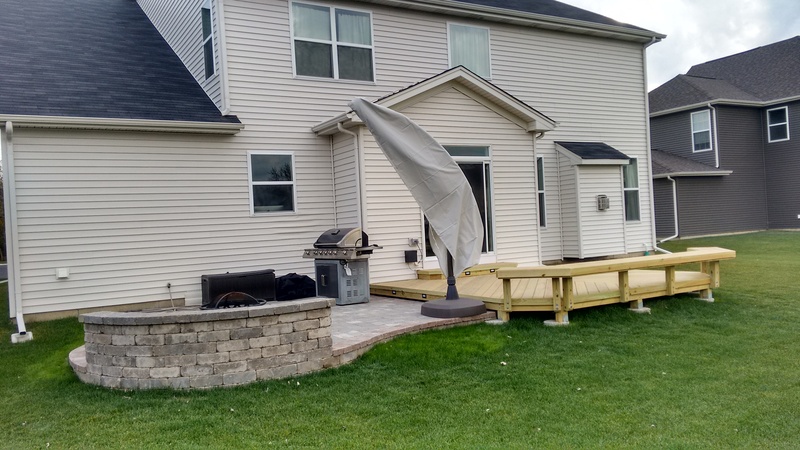 Financing your new Chicagoland deck. Financing your new Chicagoland porch. Enjoy your new space now! Enjoy the new space you’ve been dreaming of without waiting another year. Every year is a year that memories can be made and your life can be improved by having the outdoor living space you’ve dreamt of. Ensure the project you build is exactly what are you looking for and not just a portion of what you really want. While in the planning process with customers, they often mention that they wanted a larger space to accommodate both an eating and seating area. Or then mention that they wanted both a covered and uncovered area. There are several reasons to build your ideal space with your initial build instead of planning for a phase two. 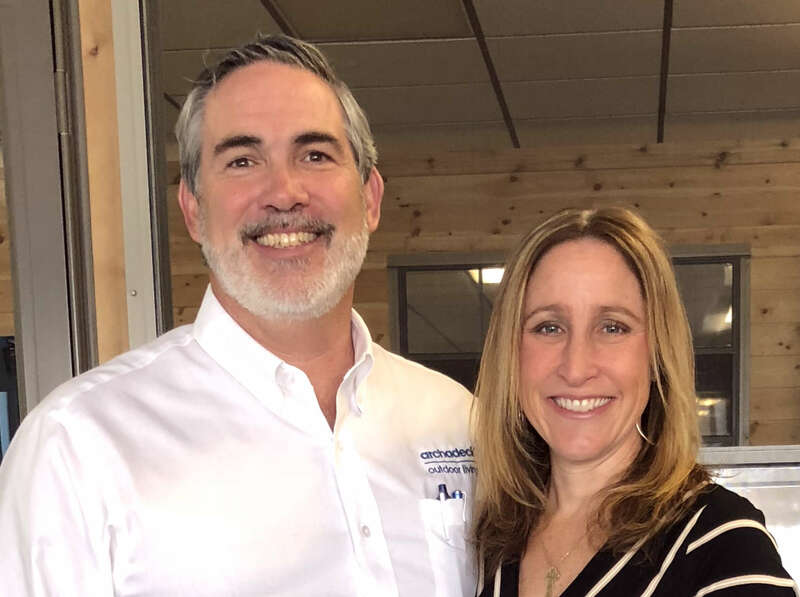 First, there are a lot of cost efficiencies in having a crew already out at your home and having the subcontractors such as electricians already out at your home. In addition, some construction might need to be reworked if you add to your space later. Utilize our financing program to help your budget get to the amount to cover the space you are really looking for. Build now instead of later. Let’s look at the real return on investment. Often times we hear people talk about return on investment. Homeowners will ask if their home will bring a higher price because it has a deck a porch. The first answer is that there will absolutely be financial upside by having a unique custom outdoor living space. Perhaps one of the more important returns on investment is in the quality of living you can enjoy at your own home. Yes, you may eliminate a couple weekend getaways because you enjoy your backyard time equally as much. You might also forego quite a few nights out at restaurants when you can enjoy the comfort of dining outside of your own back door. But there is tremendous equity in memories and improved quality of time spent at home when you can spread out more and enjoy a space designed just the way you want it. *Subject to credit approval. Fixed APR of 9.99% for 84 months. Payment Example: For $28,000 purchase, 5 payments of $233.34 followed by $484.96. Click below to apply for financing online. If you’d like to discuss your project ideas with one of our design consultants, simply fill out the form on this page, call one of our local showrooms or email us to discuss your project. The lovely space above accommodates a seating area which is covered, a deck which is uncovered and also a spacious patio for overflow and for outdoor living enjoyment. 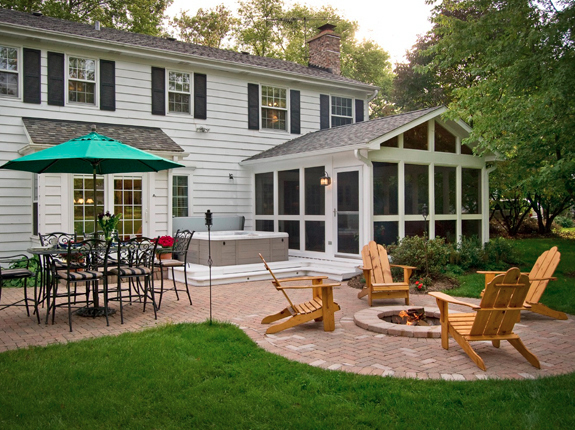 The image above shows a combination space that includes both a deck and a patio. Both spaces are large enough to accommodate a seating area, or a table and chairs. Perhaps a portable fire pit can be moved onto the patio and wrapped with some Adirondack chairs. With a combination space, the opportunities are endless.